An Indiana day care has been shut down after allegations of abuse against a 1-year-old. 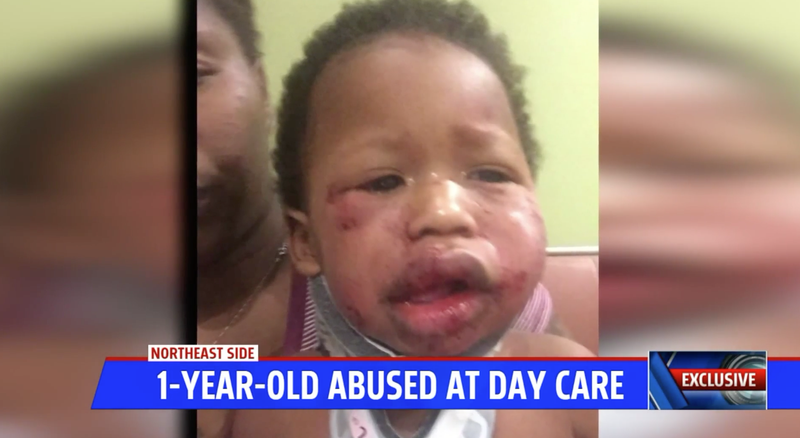 The little boy was severely beaten, bruised and left with a swollen lip within hours of being dropped off by his mother, prompting police to launch an investigation into the center. Tiffany Griffin dropped off her two sons at Kiddiegarden day care in Indianapolis on Monday, only to be summoned back within hours because her younger son had been attacked. When she arrived, she saw that her 1-year-old’s entire face was swollen, bruised and bloody; deep scratches covered his eyes and cheeks. Outraged by her son’s condition, Griffin punched a 22-year-old day care worker she believed was responsible, WXIN-TV reports. Griffin says that her son had to hospitalized for his injuries. Police now list that day care worker as a possible suspect, and the state’s Family and Social Services Administration has ordered the center to shut down. But the worker and Kiddiegarden’s owner, Haben Ghebremichael, say that a 2-year-old girl was responsible for the 1-year-old boy’s injuries. According to Ghebremichael, a worker at the day care separated the two kids during the attack, but the damage had already been done. She says that the 2-year-old child had blood on her hands following the attack. Griffin isn’t buying the day care’s story, though, citing the girl’s size and that she “didn’t look like she was the violent type,” according to WXIN. Griffin also says that the day care worker didn’t do enough after the attack on her son. “She didn’t even call the owner. She didn’t call the police, she didn’t call the ambulance, she didn’t call nobody,” Griffin told WXIN. Now she says she feels forced into becoming a stay-at-home mom because she’s not sure she can trust her children to anyone else again. Griffin told the local TV news station that she’s been in school for two years and had gotten her youngest into day care not long before the brutal attack happened. “I couldn’t protect him, and I was trying to do what’s best for my kids like going to the doctor, taking care of my health and going to school,” she said. Kiddiegarden is a licensed day care and was last inspected in October 2017. Ghebremichael told WXIN that the day care worker in charge has since been fired from the center, and she’s fully cooperating with the investigation. Police have filed no charges yet.